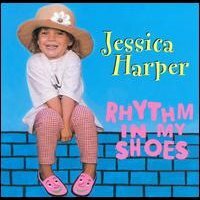 With Rhythm in My Shoes, Jessica Harper encourages kids to move, play, rhyme, jump and have fun. Introducing children to the musical styles of gospel, swing, reggae and rap, she holds their attention like a good game of jump rope, using infectious rhythms, fresh vocals and clever wordplay. She presents the world as a child knows it, encouraging a sense of self-confidence and self-worth. Whether you are 4 or 45, Rhythm in My Shoes will put a spring in your step and a grin on your face. Jessica Harper�s recordings have won many awards, including multiple Parents� Choice Gold Awards and NAPPA Awards.